Dreams of summer camp: they conjure up so many pleasant memories. Sleeping in bunk beds, the sounds of chirping crickets as you nod off to sleep, adventures exploring a private island, roasted s’mores on an open fire, outdoor showers…these are the makings of a summer of fun and adventure! 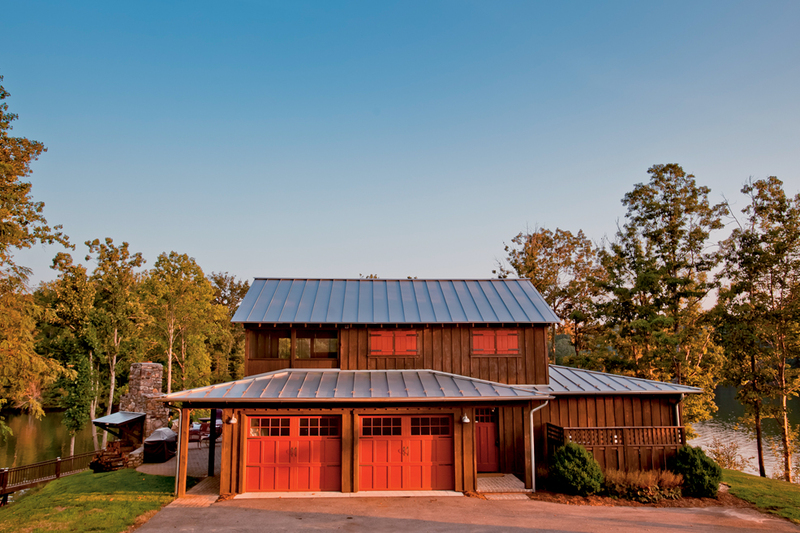 And thanks to great planning and an intuitive builder, it is what Shelby and Jason Bingham’s vacation home at Smith Mountain Lake has to offer their family and friends. 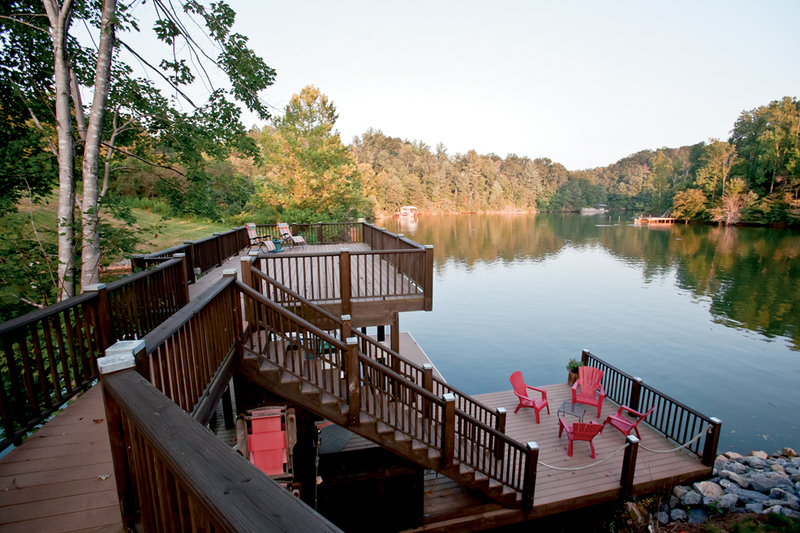 Although the Binghams moved to Roanoke nearly 14 years ago, it took them a while to discover Smith Mountain Lake. “When we rented a house here we fell in love with the lake,” Shelby explains. 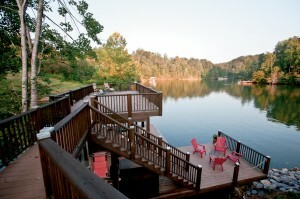 With three children, a vacation home at the lake is the perfect escape for weekends and holidays. The Binghams weren’t seriously looking for property when they found the three-acre parcel in the Goodview area of Bedford County. “It was flat, had water on three sides and was quiet. What’s not to love?” asks Shelby. “This side of the lake is not as busy and reminded me a lot of the Hiwassee River in Tennessee.” Shelby and her family frequented the Hiwassee when she was a young girl, and she has many fond memories from her visits there. Both rural and wooded, the Bingham property is actually a peninsula with great views from every vantage point—including a small island within a short swim from their dock. And because it’s not along the main channel, the waterway is quiet and perfect for swimming. Robert Kulp says that this house was planned both inside and out with an emphasis on fun. Throughout the house and on the grounds, there are many different settings where small groups of people can gather and play. And when the house is at full capacity (it is designed to sleep 20) space to spread out is essential. “I told Robert that I wanted a house that pulled you outside,” explains Shelby. Kulp sketched it out and they hired architect John Fulton of John Fulton Associates to assist with its design. The Binghams have renovated 13 houses, but this is the first house they built from scratch. Shelby’s flair for design and keen eye for detail, combined with Kulp’s technical expertise, made them a great team. 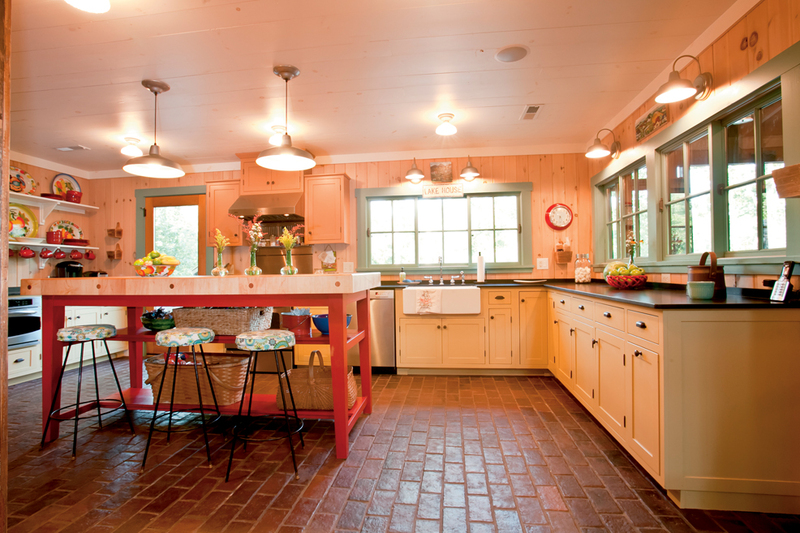 “I am a fan of traditional design and I am a fan of salvage,” says Kulp. The result is a “new-old” house, utilizing a mix of reclaimed wood and artifacts combined with the necessary creature comforts to make the home very pleasant. Shelby wanted a home that worked well as a vacation home, so her priorities differed a bit from her city house. For example, while her kitchen here has a good amount of below-counter storage, it lacks upper cabinets because she didn’t want anything to interfere with the view. “I wanted windows. I wanted to see where all of the children were and I wanted to be included,” explains Shelby. Honed granite countertops with a soft luster on the surface create an aged look. 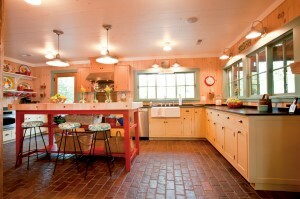 To add contrast, Kulp used a unique butcher-block surface on the oversized kitchen island. The block was manufactured by Valley Block, a Pennsylvania firm that fashions butcher blocks using an original, century-old machine. Double dovetails lock pieces of the rock-hard maple together to create a perfect work area that is slightly taller than the nearby countertops and offers storage below. A visit to the lake often means having more meals at home. With the open kitchen and an adjacent outdoor barbecue area and patio, meal preparation is a breeze. “We use the outdoor fireplace all the time to roast s’mores and other goodies,” says Shelby. The dock is also outfitted with a fridge and a countertop, providing a snacking zone down by the water. Where the brick tile is not used, lovely tones of hickory wood contrasts nicely with area rugs that Shelby uses throughout the house. One of Robert Kulp’s best ideas for the Binghams’ home literally fell off a truck. The wood paneling used throughout the home was salvaged when a truck broke down and the trucking company needed to get rid of the load—a mix of pine, beadboard and tongue-and-groove paneling. “We got a great deal on the wood and it worked for this house,” says Kulp. In many places in the home, the wood was left with its natural finish, and in others, the wood paneling has been pickled—a technique similar to whitewashing that highlights the grain and masks imperfections. With the help of its natural wood walls and furnishings, the house takes on a relaxed atmosphere. A stone fireplace, pickled wood walls and open beams create a cozy living room space, yet the cathedral ceiling and view of the loft keep the room open and spacious. Roanoke interior designer Elaine Stephenson helped Shelby choose fabrics, rugs and a color palette. “It was her idea to use Sunbrella fabric on all the furniture,” says Shelby. With an eye toward a comfortable life among children and pets, these durable outdoor fabrics are ideal. Windows and double doors abound. They all beg to be opened and Shelby is happy to oblige. There is rarely a day when a cool breeze does not circulate throughout the home. 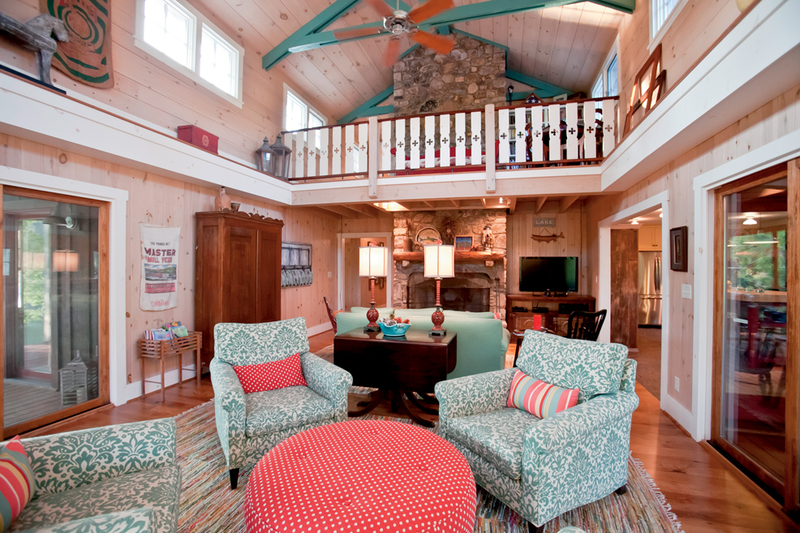 An expansive screened porch is accessed from both the kitchen and living room on one side of the house. A long table and vintage Coca-Cola cooler are perfect fixtures for this very useful room, which is often used as an extra eating area or a place to play games and take a break from the sun. 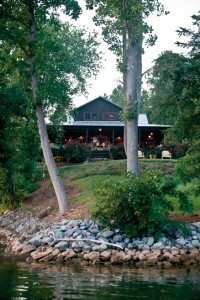 An open-air porch runs across the front of the house, offering commanding views of the lake. Rocking chairs and groups of assorted wicker furniture cover the area, but a large daybed swing is everyone’s favorite spot. According to Shelby, many overnight guests have claimed it for their bed at night, most often vied for by the teenage boys who come to visit. 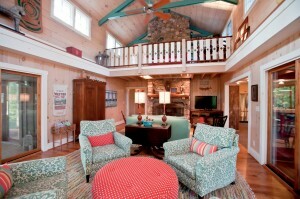 The atmosphere is carefree and perfect for a vacation home. 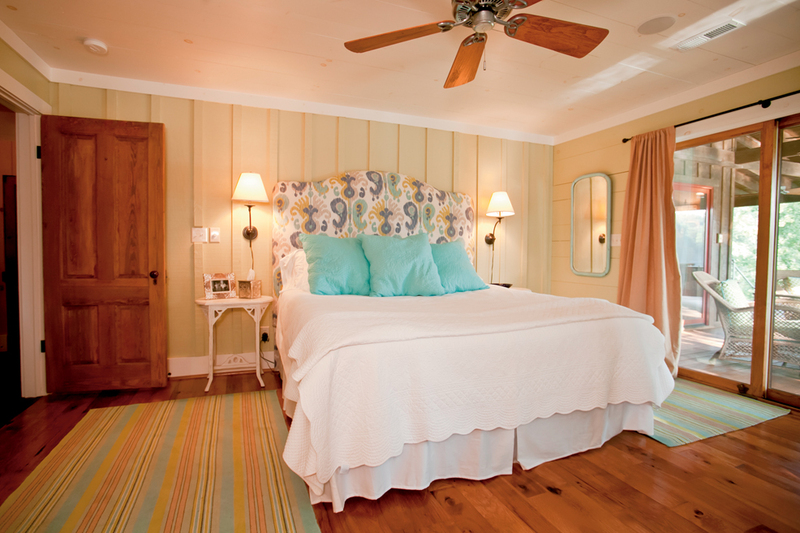 The master bedroom walls are board and batten, and fashioned from plywood. Along three walls, the boards run horizontally and according to Kulp this offers a nice juxtaposition alluding to the room’s supposed past. 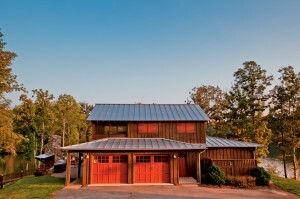 Heart pine doors and hardware are all salvage pieces, adding to the story of a house that grew as the family grew. French doors lead directly onto the back porch and all the windows offer excellent views. A back hallway is lined along one side with a gallery of photographs. They include candid family photos that are very special for Shelby and Jason, and a portrait of all of the men who worked on the house. A long church pew lines the other wall and above it hangs a giant chalkboard. 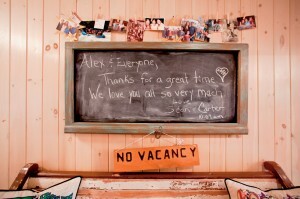 Here, family members jot down quick notes and reminders, and guests add notes of thanks for the Binghams’ hospitality. 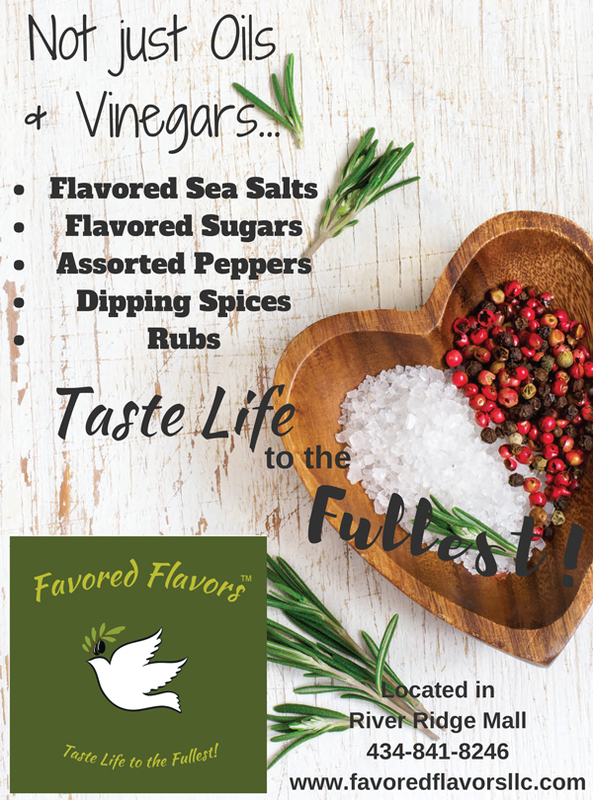 It is a great way to communicate when there is the bustle of family and houseguests moving in and out and living in the home. In the front hall, Shelby displays her collection of crucifixes. Each one has special significance, given to her by family and friends. Nearby, a simple shelf hangs on the wall—an item salvaged from The Homestead Resort in Hot Springs, Virginia. Kulp devised a unique way to disguise a necessary but unsightly vent that runs along the wall in the front hall. He used an antique grate that has a repetitive clover-like pattern on it, and then repeated this same pattern along the balusters on the stairway and the balcony railing above. With lots of guests, having a number of bathrooms available is a significant need. While all three bathrooms stay busy, probably the most useful one is the outdoor shower located directly off the downstairs half-bath. “The kids take a shower before they even come into the house,” says Shelby. And, with the laundry room just steps away, it’s easy for them to toss their wet towels and bathing suits straight into the washing machine. 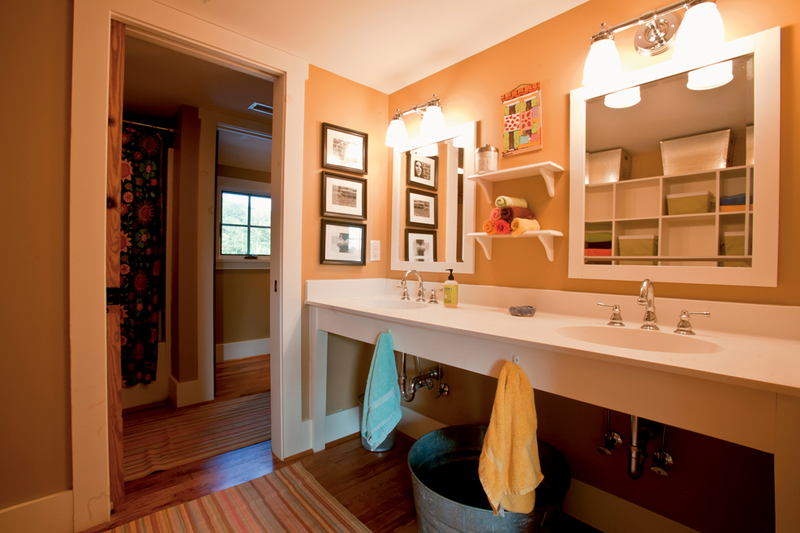 Oftentimes, the smallest rooms in a house can offer the biggest surprises. The highlight in the powder room is a large, brightly painted mural. It was a fifth grade project created by the students at Crystal Springs Elementary School. The completed piece was auctioned off at a school fundraiser, and the Binghams were the lucky bidders. Kids reign supreme on the second floor. The bunkroom sleeps ten. Built-in bunk beds, each with colorful bedding sets, are stacked in a line down one wall and extra beds line the other walls. Koiner Thomas, manager of the Marketplace at Black Dog Salvage, helped Shelby find many of the unique items that give the bunkroom its character. According to Shelby, “Koiner is so much fun to work with and has taught me so much!” The walls are covered with photographs of the Bingham children and their friends. The upstairs bathroom nearby has individual cubbies so young guests have a private place to store their belongings. 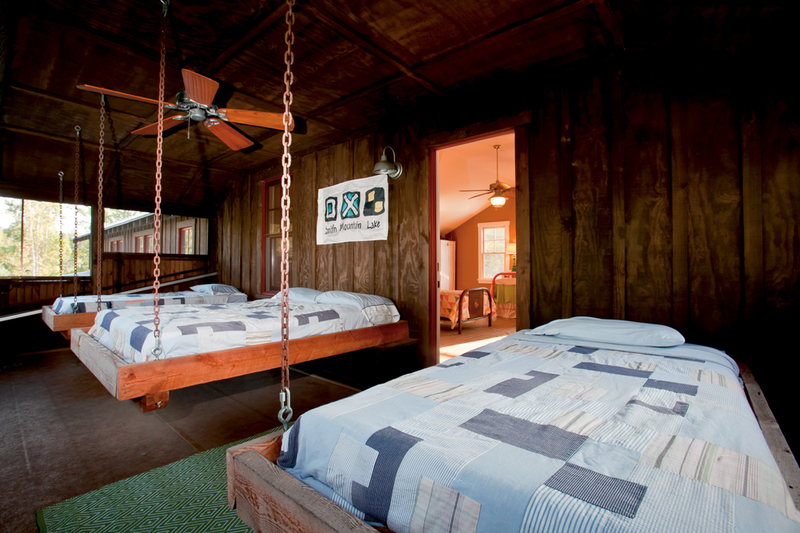 Adjacent to the bunkroom is a large, airy sleeping porch. 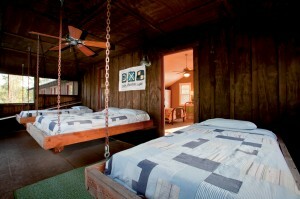 Four more guests can comfortably snooze on hanging swing beds, attached to the ceiling by chains. The porch floor is made of a heavy-duty vinyl called Duradek. Drains in each corner provide easy clean-up and a convenient escape for any rainwater that might blow in. Varsity Landscape designed the colorful and easy-to-maintain landscape. There is not a large front lawn to mow, and Knock-Out roses and Aurora Gold hard fescue line the rock-covered banks.